Selling courses online is easier than ever. With hundreds of solutions to choose from, the hardest part is finding the best ecommerce platform for your needs. Stand-alone ecommerce solutions often fall short when it comes to delivering and managing training. 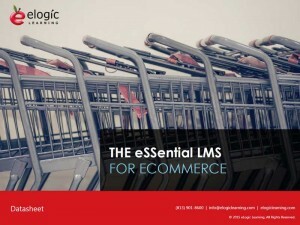 Both a learning management system (LMS) and generic ecommerce software will provide basic functionality you need. At the very least, you should be able to sell any form of training, including physical products, online courses and live or virtual events. Grant or restrict access to any part of the system, such as specific reports, account management permissions, etc. The convenience and cost-effectiveness of online training has significantly increased its demand in recent years. Smart organizations are taking advantage of this opportunity and generating revenue with their online courses. An ecommerce LMS is the best way to sell courses online, saving both time and costs by managing training processes and selling content from one convenient location. Can I be contacted about your LMS? Owen, you most certainly can! You can email sales@elogiclearning.com and one of our account executives will be more than happy to give you more information.